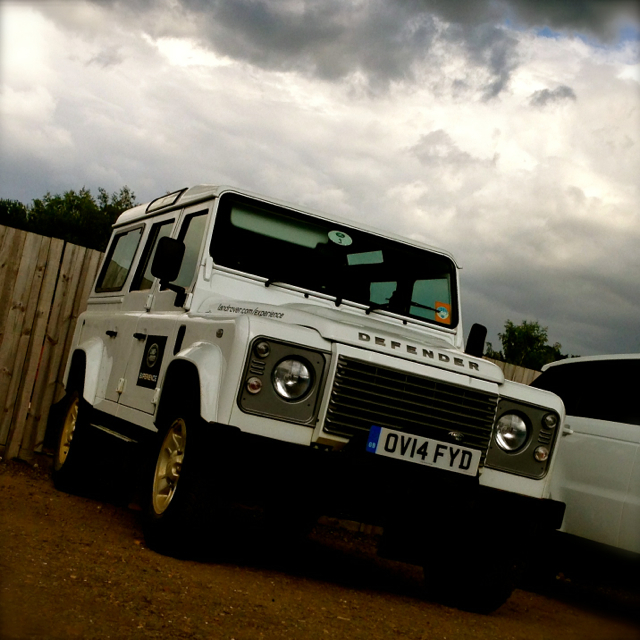 Had another invite to the Land Rover Experience, so this time me and Bob decided to drive the Defender 110. Our nearest LRE site is based on the Luton Hoo estate, so that’s where we went. Our instructor – Dave 3 – was extremely knowledgeable and a thoroughly nice bloke. So we spent 3 hours taking it in turns to drive a variety of terrains around the extensive estate; rock fields, steep climbs, very steep side slopes, and a ridiculously steep descent, all set in scenic farmland. Here’s me driving. We spent a lot of time at this sort of angle. Although it was the middle of July, Dave 3 was keen to give me some advice about driving in deep snow in my Freelander 2, which on the face of it sounds bizarre but was actually related to the use of my Freelander’s Terrain Response in gravel and deep sand. Of course, the Defender doesn’t have Terrain Response.What it does have is an excellent Traction Control system, buckets of torque, a low range transfer box and diff-lock. There’s nothing it can’t handle. Here I am negotiating an extreme side slope. This feels and looks the most terrifying from the passenger seat, because the ground seems so very close to your side window and surely it’s only a matter of time before the Defender falls onto its side! Of course the Land Rover is more than capable of dealing with this sort of terrain provided, as I said before, you have the necessary skills. Also out on the estate were a Discovery 4 and a Range Rover Sport. Here’s the ‘Sport doing a spot of cross-axle-ing. Just look at that suspension travel. And here’s Bob about to do a bit of wading. After a great afternoon trying to get the Defender muddy it was back to the LRE base for tea* and medals. Here’s one last wistful glance back at the Defender. It is a real shame that production will end in 2015. It’s an absolute classic. When I bought my Freelander, the dealer gave me a voucher for a half-day Land Rover Experience. I went with Bob, my geocaching buddy, to the Land Rover Experience at the Luton Hoo Estate. 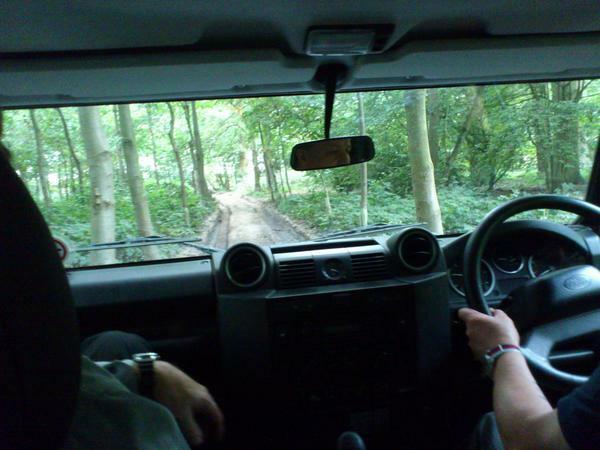 We spent a very happy afternoon driving a Land Rover Defender 110 through some challenging terrain sections. We had to conquer extremely steep hills which I didn’t think we’d get up (or down! ), a section where the Defender was leaning over so much I fully expected it to fall on its side, plus boulder fields and other hazards. We negotiated narrow trails through woodland, the Defender’s rear end squirming in the mud, and chased flocks of Partridge and Pheasant which for some inexplicable reason refused to simply fly out of our path. Hopefully I’ve learnt some skills which I can apply in my own vehicle (always assuming I’m brave enough). Although we were in the completely capable Defender and not a Freelander, our instructor was keen to point out manoeuvres we’d just completed saying “Your Freelander can do that”. Except for The Big Hill. That one was Defender-only territory. Sum up: A bloody good day, and when can I do it again? If you’re interested, this is where we went: www.london.landroverexperience.co.uk.